Definition at line 89 of file DWARFYAML.h. Definition at line 92 of file DWARFYAML.h. Referenced by llvm::yaml::MappingTraits< DWARFYAML::FormValue >::mapping(). 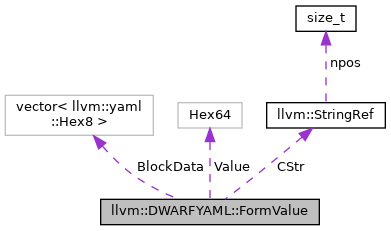 Definition at line 91 of file DWARFYAML.h. Definition at line 90 of file DWARFYAML.h.